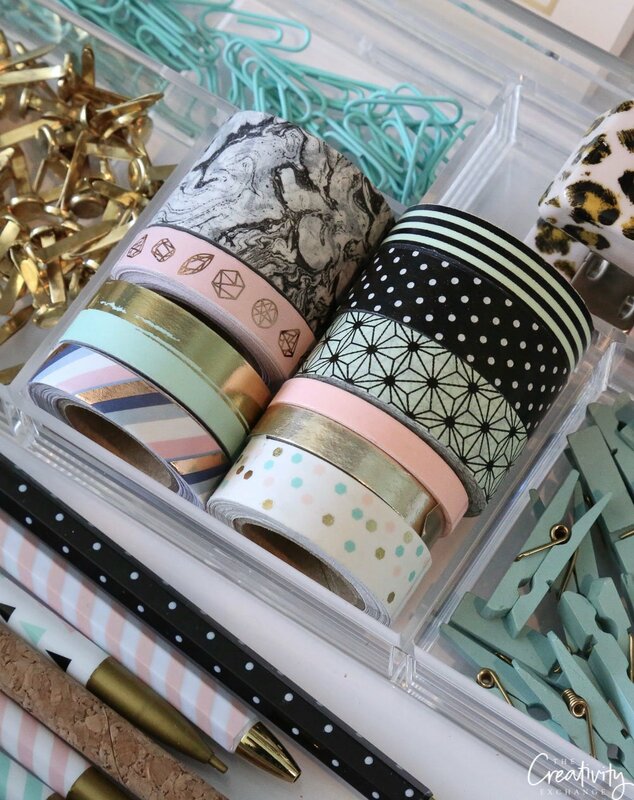 Raise your hand if you would rather watch paint dry than to spend precious time organizing your junk drawer- or any drawer in your home for that matter. Yea, it’s not the most exciting thing to do. 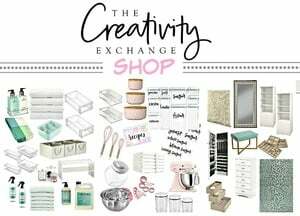 However, today, I wanted to show you guys some creative drawer organizing tips that I use in my own home along with some creative products that really maximize drawer space. In my book Organizing Your Life, I talk a lot about organizing the drawers around your home more than just the basic ways to store the usual stuff. 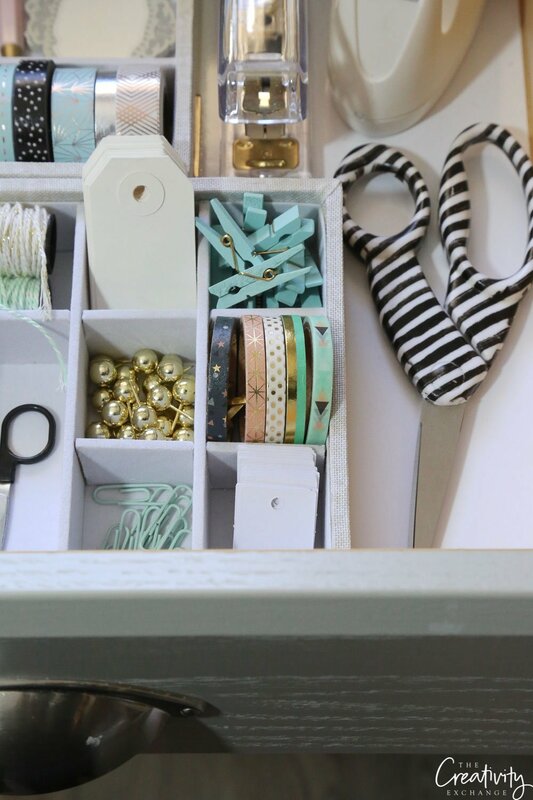 I think drawers are one of the biggest hidden gems when it comes to organizing a home because you can organize them by task (like a sewing, craft or hardware drawer) and work out of them. The best part is when you’re done with the task, all you have to do is close the drawer. 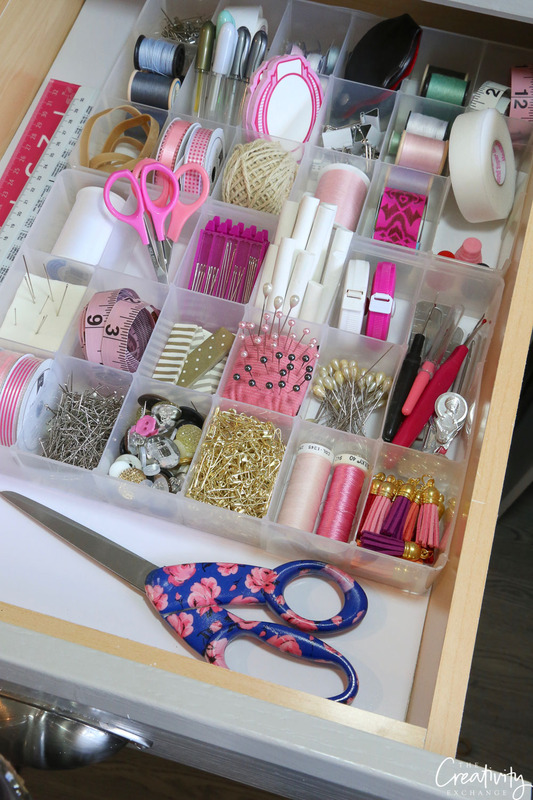 To show you exactly what I mean, in my office/craft room, I have six drawers below that I organized years ago by task; sewing, hardware, crafting, gift wrap/stationary and an office/desk drawer. Instead of having a sewing box or bin that I had to drag out every time I need to sew something, I created a sewing drawer that I use in some way almost every day. 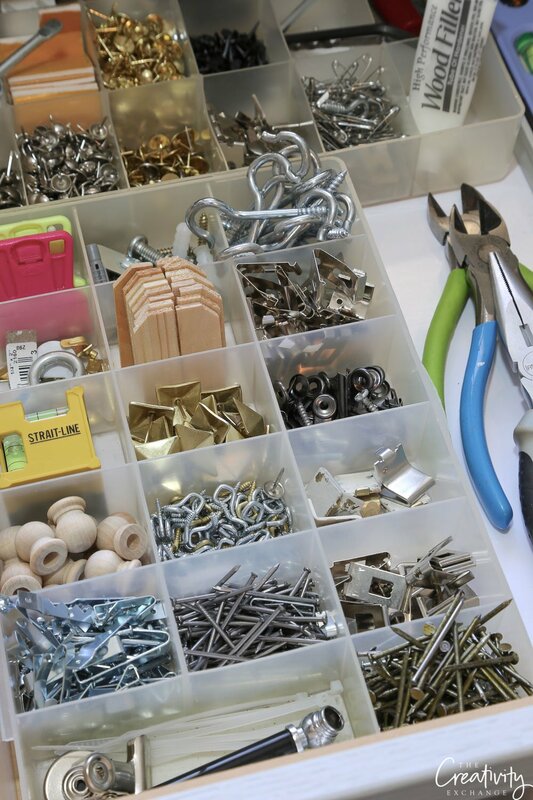 While I have hardware and supplies in my garage, I also created a drawer in the house for hardware like nails, screws, shelf tabs, etc.. in the house that I can quickly access and pull the drawer out to where I’m working on a project. 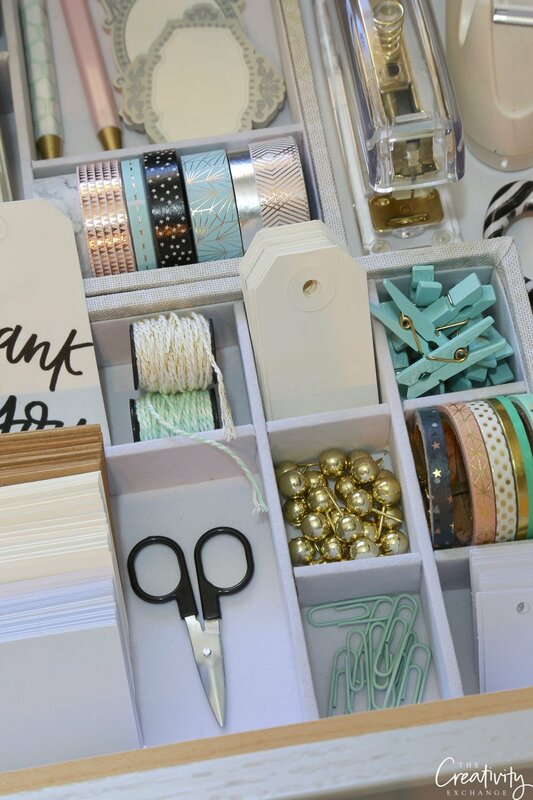 The drawer closest to my gift wrap station, I organized the drawer with all my gift wrap supplies and stationary. It’s been a life saver! 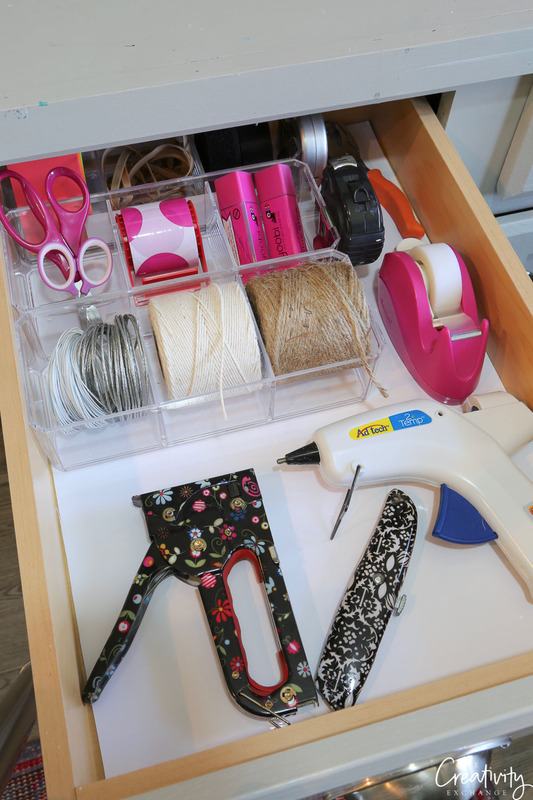 I also created a standard craft drawer with twine, hot glue gun, staple gun and all of the basic craft stuff that I use almost daily. 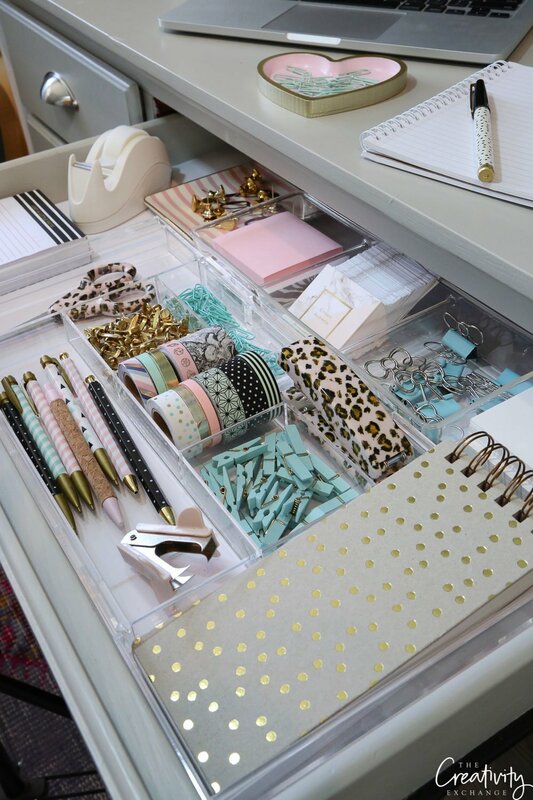 In my desk drawer, I set up the drawer to hold a lot of the little stuff and I keep notebooks, scissors, staple, tape dispenser, etc.. in my drawers to work out of instead of having a lot of little things on top of my desk. 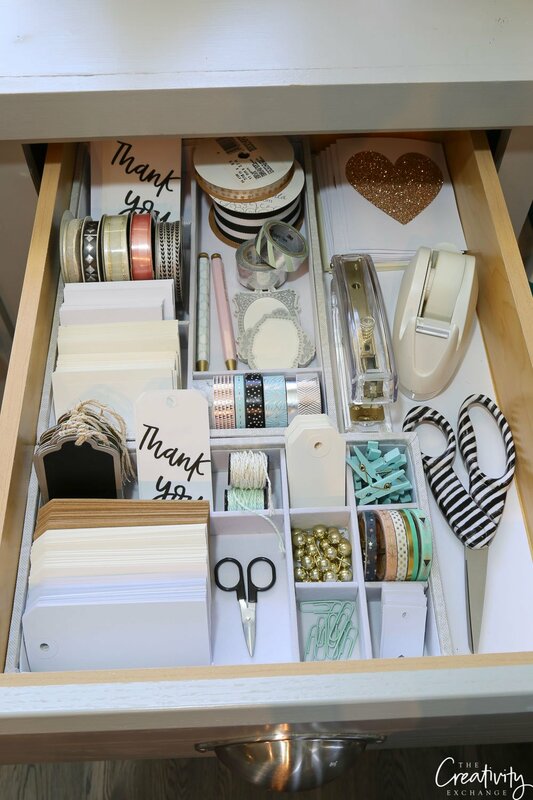 You can double (and even triple) the amount of storage in drawer simply by maximizing space and getting creative with your drawer organizers. 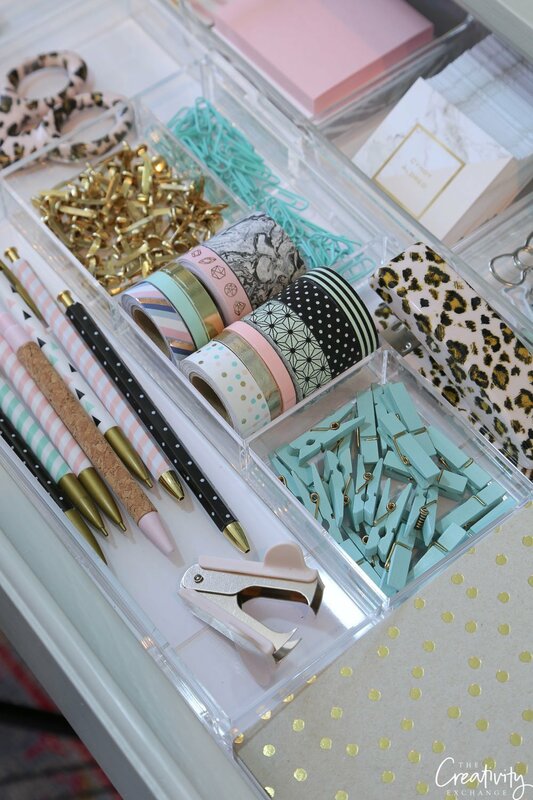 If your drawers are deep, look for creative drawer organizers that are also deep and create more storage space. 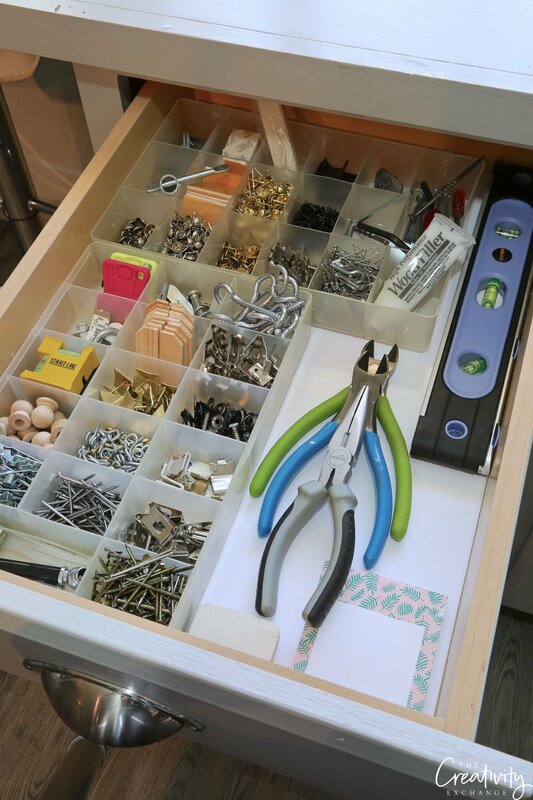 For example, in drawers like my sewing and hardware drawers that have a lot of little components that I need to keep separate, I use inexpensive plastic bead organizers (I cut off the lids) to organize all of the little stuff. You can find all kinds of various size plastic bead organizers in the jewelry making section at your local craft store. 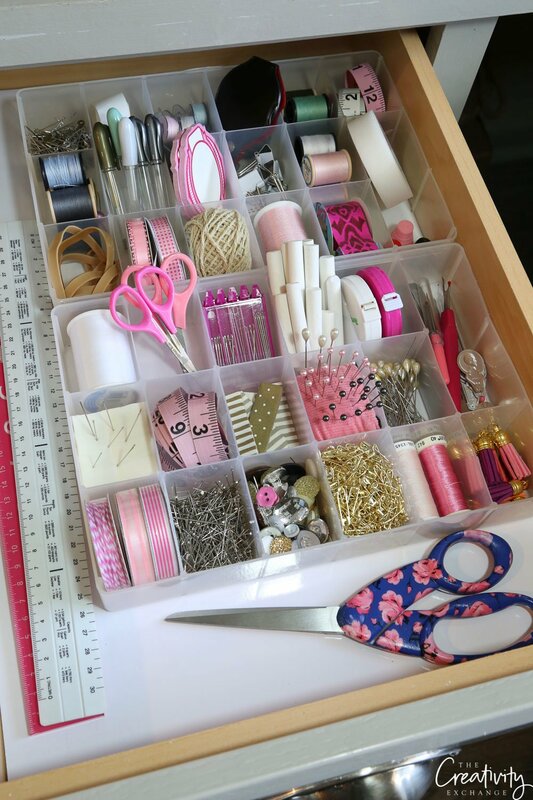 I also like the ones that you can “build” your desired sections by sliding in the dividers, which is great when you have large and small items to organize like a junk drawer. I also like to check the clearance aisles at both Homegoods and Tuesday Morning for clear plexi pantry and fridge organization that are great for organizing deeper drawers. I also always find felt/velvet jewelry organizers on the clearance aisles that I love to use for drawer organization (not just for jewelry). In fact, I used velvet jewelry organizers (below) for my gift tag/stationary drawer because the sections were various sizes that are perfect for storing gift tags and little stuff. I found these 75% off in the clearance section at Tuesday Morning. 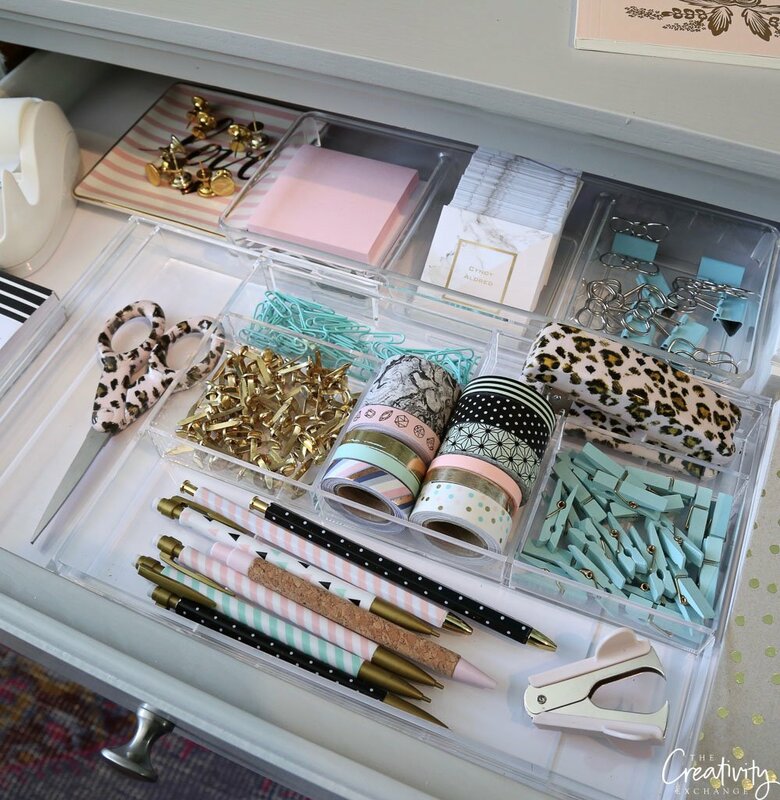 One of my favorite products to use for organizing drawers are these expandable clear plexi drawer organizers that adjust on the sides to fit a drawer and maximize space. 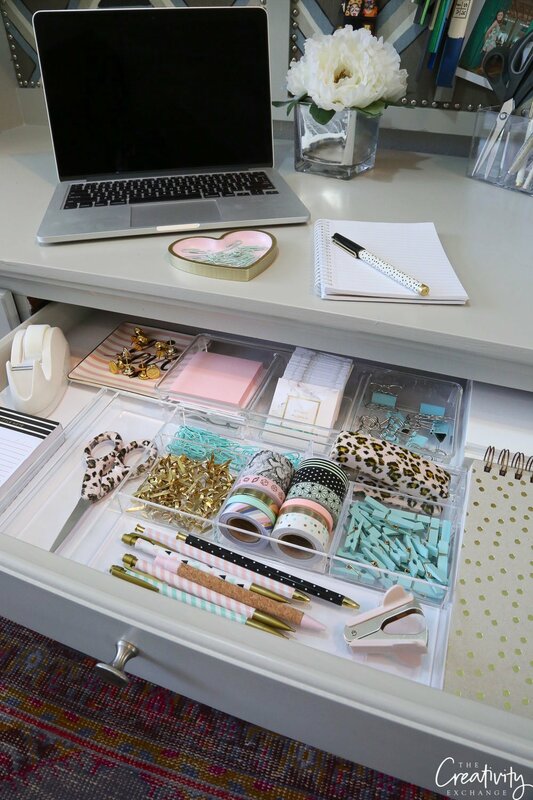 The expandable drawer organizer is advertised use is for a makeup drawer but I use it in my desk drawers and other drawers throughout my home because it maximizes space and will basically fit any drawer. In my desk drawer, I used it opened all of the way (my desk drawer is so wide that the drawer is wider than the organizer). Whether organizing your kitchen, bathroom or laundry room drawers, you stand a better chance of keeping drawers organized over time if you really think about how you use the drawer and get creative. In my bathroom drawers, I organized my drawers by skincare, hair and makeup and since my bathroom drawers are deeper, I maximize space by using clear plastic pantry and refrigerator organizing bins to create separate deep sections. In my sewing drawer, instead of just having sewing needles stored in its package, I added foam so I can quickly stab the foam with the sewing needle when I’m done sewing. I also slipped in a pin cushion for my long straight pins that I can quickly put away by just putting pins in the cushion. In my desk drawer, I used one of the sections for storing my colorful tapes that I use all of the time for different things. 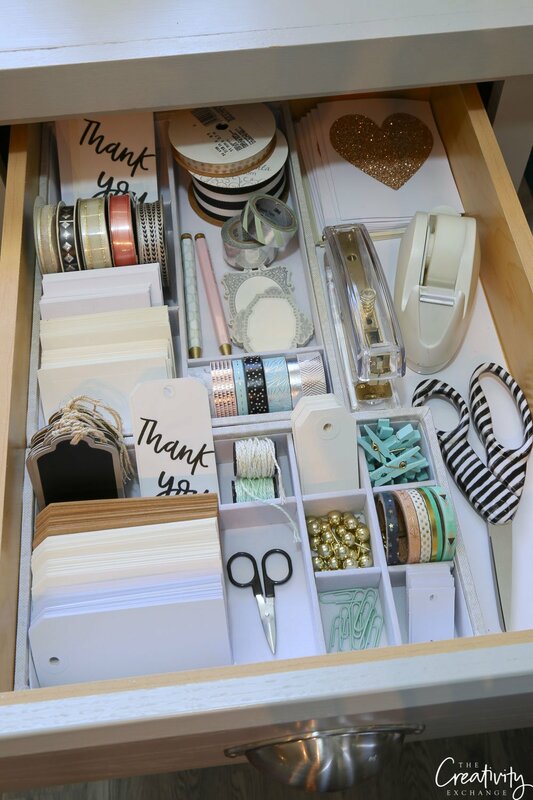 I’m always looking for ways to create more drawer space in my home because as you can see, drawers are such a great way to add more storage, especially if you organize them by task. 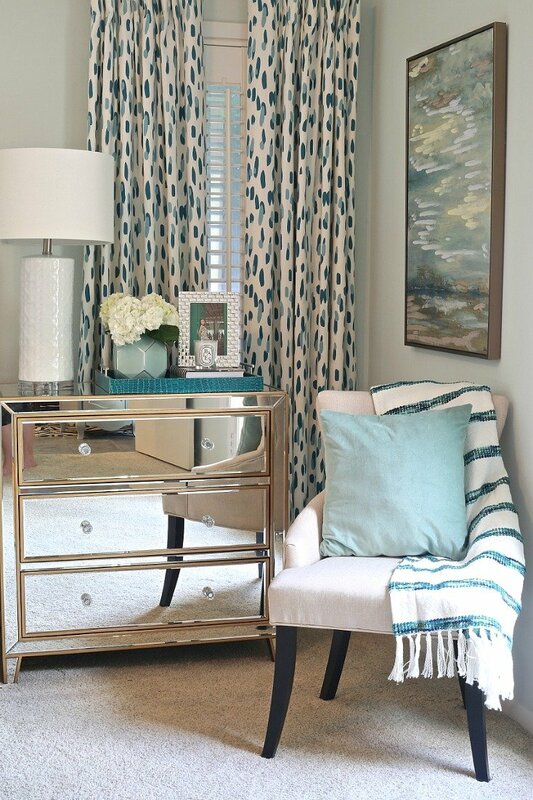 Instead of buying traditional nightstands, consider using narrow chest of drawers. I did this in our master bedroom and I use the three drawers for organizing my jewelry and accessories since I have a very small closet. My husband uses his three drawers for books and clothing, which frees up more space in his closet. 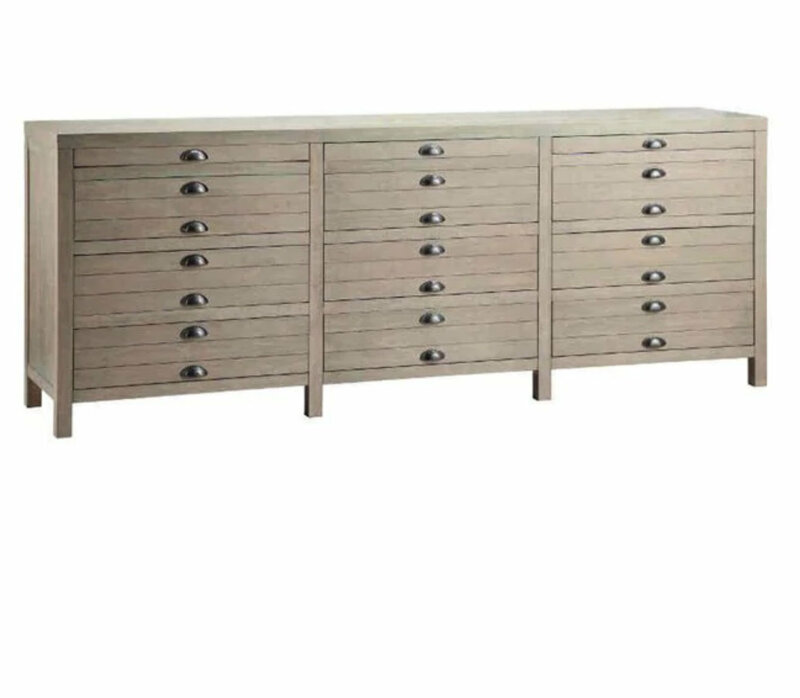 If you need more drawer space in your home, consider a chest with storage drawers for an entryway table or console table in the living room like this below. 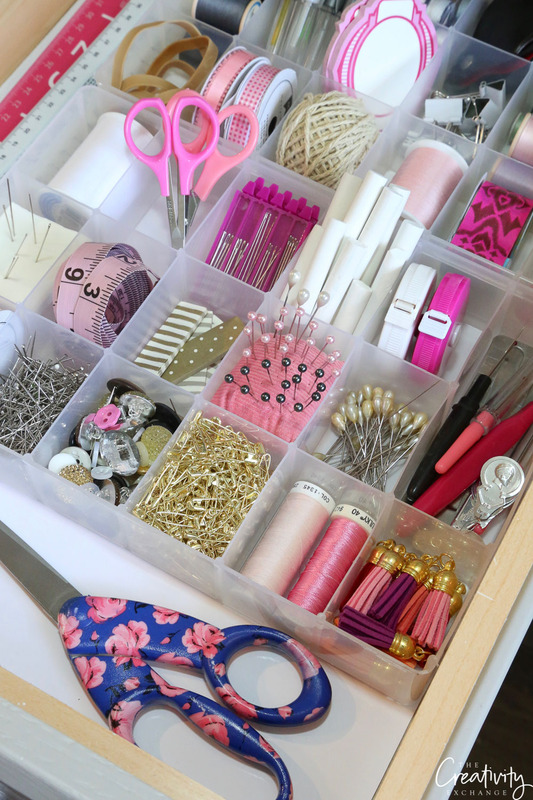 There are so many creative possibilities when it comes to really maximizing space in drawers and organizing them by task, which will save you so much time. There are so many endless possibilities! Thanks for stopping by today friends! 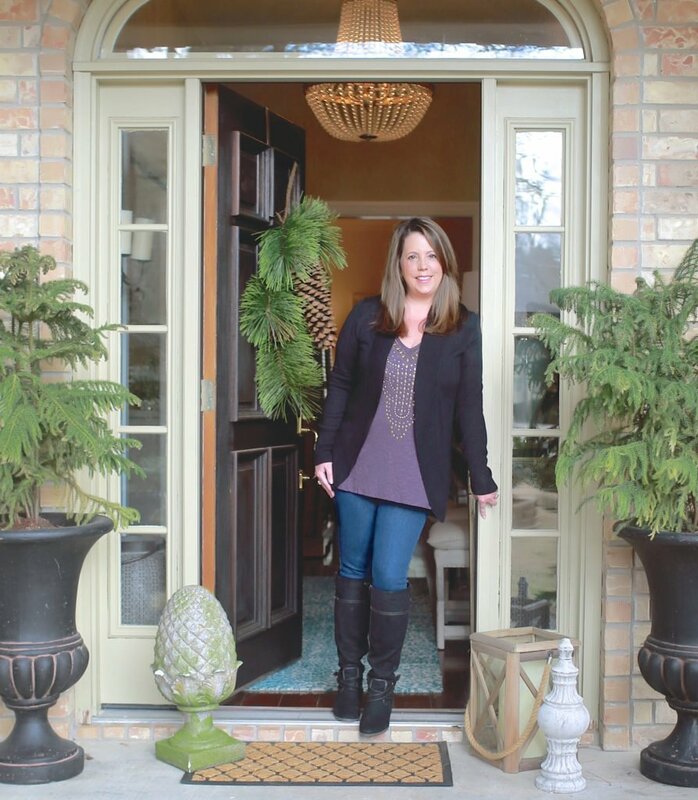 If you want to see more of my organizational projects, you can look through them here. 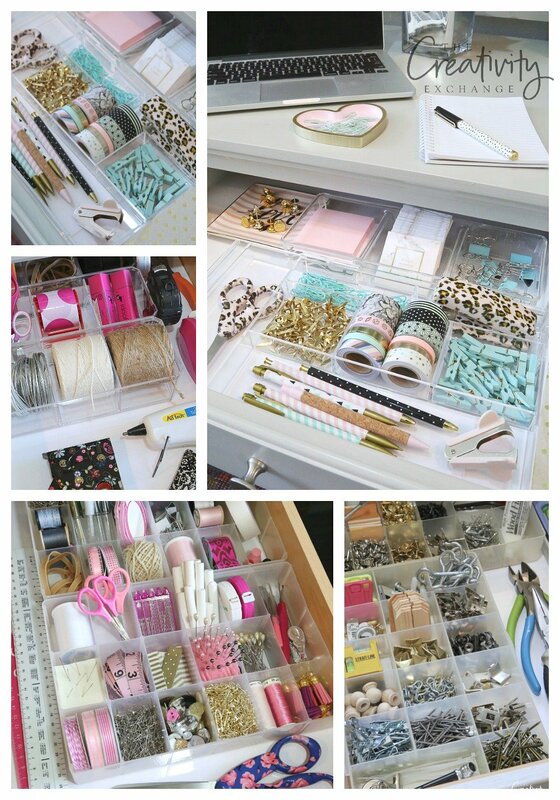 Your drawers look freakin amazing! Thanks Ellen! They sure have been a life saver for us!! Honey you have no idea what it’s like to actually be a sewer or a crafter. A drawer for each? Not even close.